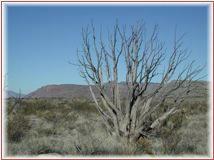 Piñon and other pines have recently undergone sharp declines in population. 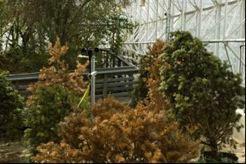 These boxed Piñon pines experience different moisture and temperature conditions inside Biosphere 2’s savannah biome. Pine trees are dying off in the western US, and researchers don’t yet understand why. Is it the environment? A disease? A parasite? Something else? Dr. David Breshears, professor in the School of Natural Resources at the University of Arizona, is leading research to find out. Scientists are using the controlled environments of Biosphere 2 to see how a warmer atmosphere and lower soil moisture might be contributing to the deaths of pine trees. In the mini biomes inside Biosphere 2, undergraduate students will take thousands of measurements on different pine plants over several months. Then scientists will compare that data to measurements from field studies at various sites throughout the region. While we might not be able to slow climate warming any time soon, or to stop the advance of the bark beetle infestation throughout the western US, this research will help scientists understand the combination of factors responsible for the pine die-off and suggest what the landscape might look like in the future.